The treatment was simple — three pills a day, best taken on a full stomach — and it cured Gabriel Serna of hepatitis C in eight weeks. He just had to wait eight years to get it. In theory, revolutionary medications have made the blood-borne, sometimes-fatal infection curable, so people with the disease need not endure the inexorable and irreversible damage it causes to their livers. Unless they are in one of New Mexico’s prisons, like Serna was for much of his wait. That’s because although the state’s inmates have the highest prevalence of hepatitis C of any group in New Mexico — more than four in ten are infected — the prisons are hardly treating any of them: Out of some 3,000 prisoners diagnosed with the disease, just 46 received treatment for hepatitis C during the 2018 fiscal year. They are locked in for their crimes, but the life-saving medications they need have been largely locked out. Whether or not the prisons are prepared for change, it may be forced upon them. In states across the country, inmates have brought a wave of lawsuits arguing that withholding the latest drugs from them is unconstitutional — and New Mexico could be next, saddling the state with more than $50 million in costs to provide overdue treatment. State officials have been aware of their obligation to treat inmates with hepatitis C for years. In a television interview in 2016, the Corrections secretary at the time acknowledged that the state might be sued if it didn’t increase drug access in the state prisons. And local civil rights lawyers are already considering ways to push for reform, including litigation. The day after Christmas, Gabriel Serna was alone in a mobile home he’d been fixing up in Albuquerque’s South Valley, not far from the neighborhood where his grandmother raised him. The repairs were one of the odd jobs he has taken to make ends meet since leaving prison. For a 55-year-old with a string of felony convictions and half a lifetime behind bars, it can be difficult to find work. Like most people with hepatitis C, he couldn’t pinpoint when he was infected — most people who contract it do not experience immediate symptoms and may be unaware they are carriers for years. Scientists didn’t even identify the virus until 1989, at which point prevention efforts like screening it from blood banks could begin, so the baby-boomer generation who came of age before then has five times the prevalence of hepatitis C of younger adults. When Serna first tested positive in 2001, he reasoned that he might have picked it up when he had a tattoo of an old girlfriend’s name inked over. He had also injected drugs since he was 11, when a neighbor first introduced him to heroin, so there had been ample opportunities to share dirty needles over the years. But the way the infection is contracted has no bearing on its effect. The virus is insidious, causing progressive liver damage that ultimately results in scarring and then liver cancer or end-stage-liver disease. At the point a patient begins to experience symptoms, they may have just months to live. More than 3.5 million Americans are thought to have hepatitis C and it kills about 20,000 of them each year, triple the number killed by AIDS. New Mexico’s prevalence is particularly high: researchers estimated that as of 2010, nearly one in forty of the state’s adult residents were infected, 60 percent higher than the national average. And nowhere is the concentration higher than in the state’s prisons, where as of January 2019, 44 percent of people screened positive, according to corrections officials — the highest known share of any correctional system in the country. That is indicative of the dire circumstances in New Mexico, but also of the state’s willingness to acknowledge it: beginning in 2009, all people locked in its prisons have been offered screening (to which they can opt out, but most accept). Many other states have put their heads in the sand, screening just those inmates who request it, so they have no accurate measure of the extent of the problem. Until a few years ago, there was a plausible argument that not much would come of the information. The standard drug treatment for hepatitis C was barely tolerable: it took six months, induced side effects like depression and severe fatigue, and failed to cure the patient as much as half the time. But then in 2014 Gilead Science introduced the first of a series of game-changing drugs known as direct-acting antiretrovirals. Suddenly most patients could be cured, with few to no side-effects, in as little as eight weeks. The drugs were revolutionary and the manufacturers knew it — and priced them accordingly. Gilead launched its first, sofosbuvir, at $84,000 per course of treatment; since then competing therapies have driven down prices but they still run around $20,000. And private and public insurers have proven willing to pay: even at that price, it is cost-effective to immediately cure hepatitis C rather than face its dangerous and costly consequences down the line, when a patient’s only recourse may be vying for a scarce liver transplant. But correctional health systems across the U.S. have balked. In a typical prison budget, healthcare is among the costliest item after staff salaries, and states face the full cost without assistance from the federal government (long-standing federal regulations bar inmates in both federal and state prisons from receiving coverage under Medicaid or Medicare until they are released, although many of them would otherwise be eligible). So, prison health systems have erected barriers to treatment, narrowing eligibility to inmates whose livers have already become irreparably scarred. There is a certain logic to prioritizing the sickest people but it means patients must wait for the virus to damage their livers before they can have the infection addressed. A set of New Mexico Correctional Department guidelines from June 2018 indicated that they restrict treatment to inmates free of major disciplinary infractions for at least twelve months, on the argument such behavior “indicates an inability or unwillingness to comply with regular programming.” Even a history of multiple minor infractions, as irrelevant to health as “abusive language or gestures,” can exclude a patient from treatment. “I would put in medical requests and they told me ‘No, sir, you got to have a clear conduct.’”Gabriel Serna describing rejection of his requests for Hepatitis C treatment in prison. The corrections department does not even manage to treat all the patients it designates as “Priority 1” due to the gravity of their illness. And data from the last three fiscal years offers little evidence of meaningful efforts to expand access: as the market price of hepatitis C drugs fell during that period, rather than expanding access to more people, the corrections department cut spending on the drugs by 72 percent. Selvage said for the coming fiscal year his goal is to triple the number of people treated, at a cost of $2.5 million. But by his estimate, the department would need $50 million of medications to treat all infected people in their custody — a thirty-fold increase in spending over 2018, more than their entire annual healthcare budget. And that doesn’t reflect additional hires needed to manage thousands of new patients. He also argued that the department should upgrade from its archaic, paper-based health record system to an electronic one that allows for far more detailed tracking of cases, at a cost of $3 to $5 million. Without new resources, the corrections department will continue to pass the buck, leaving prisoners to seek care on their release from outside clinicians. This, at least, it does commendably, by pre-enrolling inmates in Medicaid so they are insured as soon as they are freed. 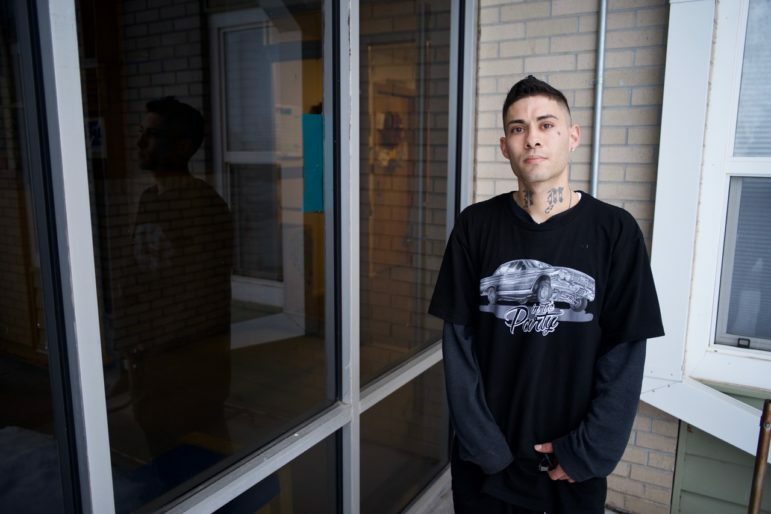 And it’s how Serna finally got treated: on his departure from the penitentiary, an acquaintance put him in touch with a nurse, Debra Lockey, who gave him an appointment that same day. She is happy to see people immediately upon their return from prison but the tumultuous period of reentry can be a risky time to start a course of treatment that demands regularity to successfully eliminate the virus. In several instances, Lockey began treating patients who were then re-arrested, interrupting their therapy midway and threatening to foster drug-resistance. “I would actually get their medication delivered to the clinic and then make the drive out to the jail to give them to the nurse there to see if they could continue the treatment,” she recalled. One such client successfully completed therapy, but two were unable to do so. But change may be coming, from the courts. 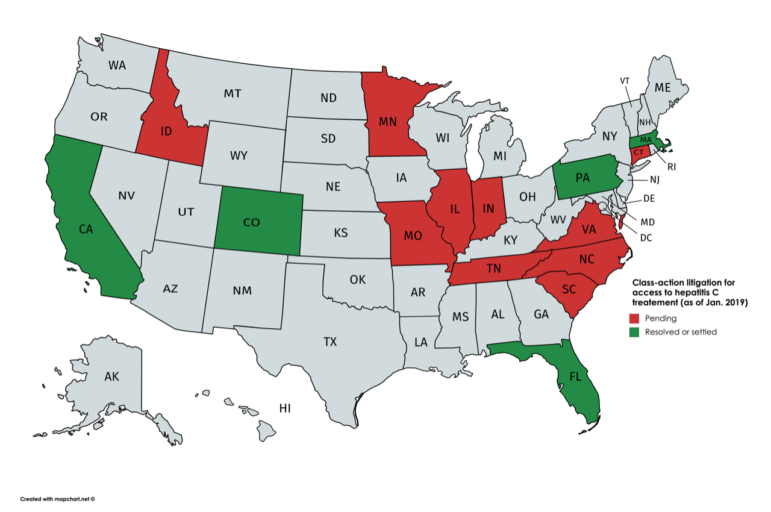 Since 2015, prisoners in at least 16 states have introduced class-action lawsuits asserting a right to access the new therapies. The Eighth Amendment forbids cruel and unusual punishment, which has been interpreted to mean that states cannot show “deliberate indifference” to the serious medical needs of their prisoners — including by withholding treatment solely as a matter of cost. And as universal treatment for hepatitis C has become the standard of care for people in the outside community, withholding it from those who are locked up looks increasingly untenable. In the first major ruling on the matter in November 2017, a federal judge in Floridaordered the state to accelerate prisoners’ access to treatment, at a cost of hundreds of millions of dollars. Soon after, Colorado settled a lawsuit and agreed to allocate $41 million in new funding to treat all people with hepatitis C currently under its custody, andMassachusetts and Pennsylvania quickly followed. A handful of governors, including New York’s Governor Andrew Cuomo and Governor Jay Inslee in Washington State, have preempted litigation by committing to provide universal treatment in their prisons as part of strategies for eliminating hepatitis C statewide. Civil rights advocates in New Mexico are aware of these trends. Frances Carpenter, a private attorney who has represented incarcerated people in other cases over the years, said that she was struck by her clients’ descriptions of the corrections department’s narrow criteria for treatment access. “Their parameters are just completely arbitrary,” she said. Recently she met with the local chapter of the American Civil Liberties Union, which has filed public records requests seeking information about the state’s treatment practices, according to its legal director Leon Howard. The team say they are watching the actions of Democratic Gov. Michelle Lujan Grisham carefully, and should she fail to act, litigation is a real possibility. Last week, Lujan Grisham named Julie Jones, who oversaw Florida’s prisons, to lead New Mexico Department of Corrections. “We simply don’t have enough funding to treat everybody who needs to be treated at the time of infection.”David Selvage, Health Services Administrator with the Department of Corrections. While a court’s decision could expand treatment to the pool of sick inmates already in the state’s custody, the cures for hepatitis C do not confer immunity against reinfection, so tens of thousands of dollars of drugs and months of delicate care can be squandered, in an instant, if a patient is re-exposed. Advocates say that to effectively address the epidemic, policymakers need to allow prisoners with opiate addictions to receive medication-assisted treatment to help them reduce their drug use and slow spread of the disease. But at present, when it comes to addressing addiction, the state prisons offer an environment that does much more harm than good. Snow was falling outside the church in Los Alamos where Fernando Trujillo was at work cleaning the carpets. His slight frame was enveloped in a set of oversized shirt and pants, and a pair of rimless glasses perched on his high cheekbones. The 27-year-old had been hired for the custodial job by his dad’s business, and he was living in his mom’s house down the hill in Española, where he grew up in the epicenter of northern New Mexico’s opiate epidemic. Fernando Trujillo outside the church in Los Alamos where he does custodial work. Thus began a cycle in which charges for drug possession were invariably followed by new arrests. Trujillo might be released on the condition that he quit using drugs, but would then relapse and fail a mandated urine analysis. At one point he managed to stay clean, but his boyfriend — “my high school sweetheart, my Bonnie and Clyde” — was using and overdosed, and Trujillo fell off the wagon again. Of the last six years, he figures he spent more time locked up than on the streets. Trujillo accepts personal responsibility for his actions, he says, but in crucial ways the criminal justice system made it harder for him to quit using. For one thing, he says heroin is more freely available in prison than it is outside: “The state system, it’s like a party.” He’s convinced that if he gets locked up again he will relapse. To stay sober, he also depends on a daily dose of buprenorphine/naloxone (known better by its brand name Suboxone), which binds to chemical receptors to reduce physiological cravings. In combination with other behavioral therapies, this type of medication-assisted treatment has been shown to help people surmount their addictions and cut risk of a fatal overdose by as much as half. Yet New Mexico’s state prisons bar inmates from obtaining this medication while they are locked up, even if they had a doctor’s prescription for it at the time of their arrest. This is wrong-headed, says state District Judge Jason Lidyard, who was appointed last year by Gov. Susana Martinez and operates a drug court in which Trujillo now participates. “With respect to how the criminal justice system deals with drug addiction, it’s very insensitive to it.” Lidyard was 21 when he lost his own father to a drug overdose, and while he condemns the addiction that led to it, he considers it a blessing that the criminal justice system never deprived his father of his liberty while he struggled with it, which would have jeopardized the stability of their family. Limiting access to medication-assisted therapy may also be unconstitutional and a violation of the American with Disabilities Act. Last fall when a Massachusetts jail refused to give a prisoner access to the medication-assisted treatment he had been prescribed on the outside, a federal judge issued an injunction. Sally Friedman, a vice president at the Legal Action Center, a national group that advocates for sound public policies towards addiction, called the decision “groundbreaking” in an email, and wrote that “corrections officials nationwide should expect to see more litigation like [it].” Lawsuits are already underway in Maine and Washington State. New Mexico’s state prisons have a local model to look to: Albuquerque’s Metropolitan Detention Center. Beginning in 2005, the Bernalillo County-operated jail has allowed detainees with prescriptions for methadone to fill them, and it started initiating the therapy for other detainees who needed it. Governor Lujan Grisham is no stranger to the jail’s program: she helped start it, as then-state health secretary. “It’s a legal treatment aimed at solving the problem and stopping the revolving door,” she said at a press conference after its opening in 2006. Reforming the way New Mexico treats addiction could help it address hepatitis C, too. In a cohort of young adult injection drug users, those on medication-assisted treatments like Trujillo were 60 percent less likely to acquire the virus. Ted Alcorn is a writer whose work has appeared in The New York Times, The Atlantic, and The Lancet. He lives in New York City and was raised in New Mexico.